According to Wikipedia, provisioning is "the process of preparing and equipping a network to allow it to provide (new) services to its users". We'll draw from this concept the part of preparing and equipping. provy is a infrastructure provisioning automation tool. Its main goal is making it easy to create highly-scalable architectures with simple scripts. provy stands on the shoulder of giants! fabric for the networking part and jinja2 for templating capabilities. Before installing provy you will need to ensure you have swig installed, as m2crypto needs it. Here is how to install it in some platforms. Just ensure that you have /usr/local/bin on your path. If your platform is not listed above, try searching in your package manager for swig and install it given the search results. provy is FOSS and you can find its source code at its github page. Starting to provision servers with provy is extremely simple. We'll provision a fairly scalable infrastructure (yet simple) for a Tornado website. Tornado is facebook's python web server. It features non-blocking I/O and is extremely fast. Our solution will feature a front-end server with one nginx instance doing the load-balancing among the tornado instances in our back-end server. The back-end server will feature 4 tornado instances kept alive by supervisor (a process monitoring tool). Ok, now that we have a functioning application, let's deploy it to production. First, let's create a local "production" environment using Vagrant. Using Vagrant is beyond the scope of this tutorial. Ok, now when we run vagrant we'll have two servers up: 33.33.33.33 and 33.33.33.34. The first one will be our front-end server and the latter our back-end server. It's now time to start provisioning our servers. In the same directory that we created the website.py file, let's create a file called provyfile.py. The first thing we'll do in this file is importing the provy classes we'll use. We'll also define FrontEnd and BackEnd roles and assign them to our two vagrant servers. Even though our script does not actually provision anything yet, let's stop to see some interesting points of it. You can see that our roles (FrontEnd and BackEnd) both inherit from provy.Role. This is needed so that these roles can inherit a lot of functionality needed for interacting with our servers. Another thing to notice is the servers dictionary. This is where we tell provy how to connect to each server and what roles does it have. Let's start working in our back-end server, since our front-end server depends on it to run. Then we'll need to copy the website.py file to the server. provy can easily copy files to the servers, as long as it can find them. Just move the website.py file to a directory named files in the same directory as provyfile.py. The update_file method tells provy to compare the source and target files and if they are different update the target file. For more information check the documentation. Ok, now let's get our front-end up and running. provy comes with an nginx module, so it is pretty easy configuring it. Save them as files/nginx.conf and files/website, respectively. See how we passed the user name as an option to the nginx.conf template? provy allows this kind of template interaction in many places. For more information, check the documentation. After these 3 commands finished running (it might take a long time depending on your connection speed), you should see Hello World as the result of the curl command. provy uses a python module called provyfile.py in order to retrieve the definitions of your roles, servers and the relationships between them. This is the overall structure of a provy provisioning file. The first imports will be very similar among most your provyfile.py files. You'll always import Role and most of the time will use one of the other built-in roles. 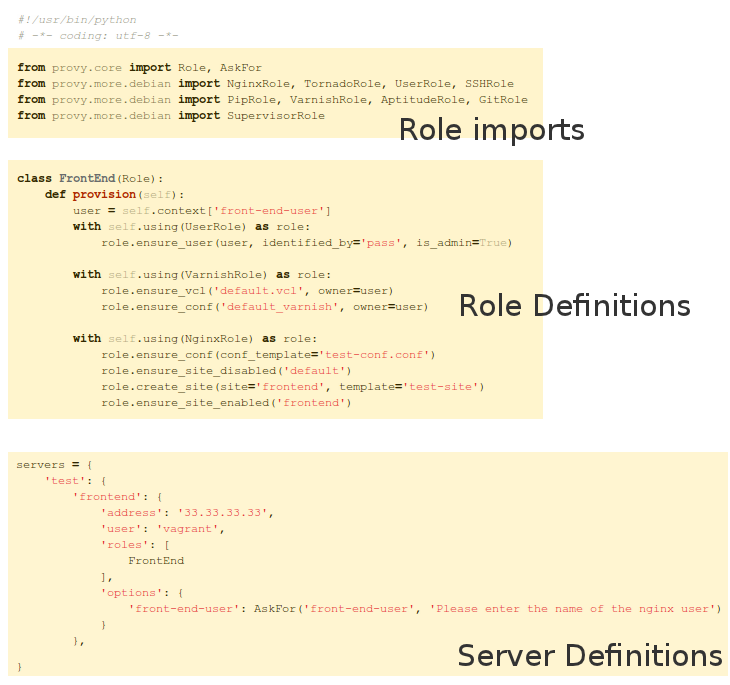 After the imports, come your Role Definitions. This is where you'll specify how you want your servers to be built. You can find more about how to build roles in the What are roles? and Using Roles in my Roles sections. Last but not least, you describe your servers and how they relate to roles. This brings us to the AskFor parameter (provy.core.AskFor). This class allows you to specify that a given option for a given server should be filled at runtime, either by passing in the command line or by asking the user doing the provisioning. AskFor takes two arguments: key and question. The key argument is needed to allow passing the argument when running provy (more on that in the next section). The question is used when provy asks the user running it for the parameter. AskFor is really useful for sensitive data such as passwords. You don't want to expose this data in your provyfile in plain text. You just use an AskFor parameter for it and supply the information at runtime. Let's look at a sample of AskFor usage. All arguments must take this form of key=value, with no spaces. The key must be exactly the same, case-sensitive. provy comes with a console runner. It's the same one we used in the Getting Started tutorial. The option you are most likely to use is the server option. It tells provy what servers you want provisioned. As we saw in the provyfile and Runtime Arguments section, we can also supply AskFor arguments when running provy. All arguments must take the form of key=value, with no spaces. The key must be exactly the same as the one in the AskFor definition, case-sensitive. Roles are the most important concept in provy. A role specifies one server capability, like user management or a package provider. provy comes with many bundled roles, but you can very easily create your own roles. As a matter of fact, if you followed the Getting Started tutorial, you have already created two custom roles. Creating new roles is as easy as creating a class that inherits from provy.Role and implements a provision method. This method is the one provy will call when this role is being provisioned into a given server. The using method of the Role class is a special way of using other roles. The reason for using it is that it maintains context and the provy lifecycle (more on both later). The provision_role method does exactly the same as the using method, except it does not enter a with block. This should be used when you don't wnat to call anything in the role, instead just have it provisioned. Some methods provided by provy (including update_file) support passing in options that may be used in templates. provy uses jinja2 for templating, thus supporting if/else statements, loops and much more. It's advised that you take a look at jinja2 docs. jinja2 will look for files in two different places. The first one and probably the one you'll use the most, is a directory called files in the same path as provyfile.py. Any files you place inside this directory may be used as templates to be uploaded to the server being provisioned. Since provy is built on top of fabric, you can use its put method as well to put any file or folder to the server. It's advised to use the bundled methods that come with provy, though, as those are idempotent. The other place you can put files is in a templates directory inside Role apps. The supervisor role uses this approach, if you want to take a look at an example. If you do place files in the templates directory, do not forget to call the register_template_loader method passing in the full namespace of your app (more details in the provy.more section below). We used custom files in the Getting Started section to provide the needed configuration files for nginx. provy is divided in two namespaces: provy.core and provy.more. It is divided like this to make it easier to find the roles you need. provy.core features the code that actually makes provy run, like the console app or the base Role. provy.more features every single specialized role that helps users in provisioning servers, like NginxRole or AptitudeRole. Both will be documented here, even though you are advised to take a look at the code, since the docs might not be up-to-date yet. At this point, provy only supports Debian-based (debian, ubuntu) and CentOS distros. If you think your distribution should be here, please consider contributing. This area details what features of provy are supported in each operating system. Currently all features are supported under debian distributions (including ubuntu). The easiest way to verify what's available is checking the Roles Documentation section. Currently support to user management, git repository management and packaging (via pip and yum) are supported. More supported features to come soon. If you think you can help improve this, please consider contributing. This recipe features a django website with 4 processes and 2 threads per process. Nginx serves the requests via reverse proxy, while load balancing the 4 processes. Each django process is a gunicorn process bound to a port ranging from 8000-8003. Django's static files are served using nginx. If you are using provy, please let us know and we'll put your company or website name here. This is a good way for us to gauge whether we are moving in the right direction. Just join the mailing list and send us an e-mail. A form for joining the mailing list is available here. If you have any ideas that can improve provy, or feature requests or even just some suggestion on the library or on this website, please let us know! We value your opinion more than anything else. If you don't have the time to contribute to the project, contribute with your ideas. We have setup an easy-to-use way of providing feedback with the help of the nice people at uservoice.com. You can go to our uservoice.com page at http://provy.uservoice.com and vote in the ideas given by users, thus helping us select ideas that will be implemented first. Or you can just click on the button in the right-bottom of the screen that says feedback & support and tell us any number of things you think will help the project. In the event that you not only want to send us your idea, but want to implement it and contribute to the project, keep reading the Contributing section. Contributions are very welcome. Specially roles. If you implement a role that you think others might be using, please contribute. To contribute head to provy's github page, fork it and create a pull request. Contributors will get listed here for their contributions. The place to create issues is provy's github issues. The more information you send about an issue, the greater the chance it will get fixed fast. If you are not sure about something, have a doubt or feedback, or just want to ask for a feature, feel free to join our mailing list using the form below.